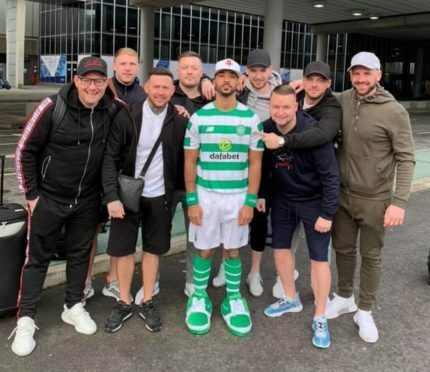 Aberdeen defender Shay Logan has been forced to don the famous hoops of Celtic after being pranked by his friends for his stag do. The Dons defender, who is due to marry fiancée Sam Goodrum, has been pictured on social media in a full Celtic kit featuring the name and number of Hoops captain Scott Brown and there are even some big shoes made famous by club mascot Hoopy the Huddle Hound thrown in for good measure. Logan, clearly, is less than impressed at his pals’ choice of clothing for him and was quick to state despite his carefully chosen attire he was firmly a Don.